Maersk, the end-to-end transport and logistics company and the biggest food transporter in the world, is currently accepting applications from agrifood tech startups to take part in an equity-free startup support program called FoodTrack. The program, a partnership with the multi-vertical startup accelerator, Rockstart, will focus on combating food loss across the supply chain. “In addressing the growing challenge of food loss, we believe a value chain approach towards the food system is required, and with Maersk’s substantial involvement in food transportation, we want to be part of the solution in collaboration with startups,” says Peter Votkjaer Jorgensen, venture partner at Maersk’s venture arm Maersk Growth. To be part of that solution, Maersk Growth is hosting a month-long startup program at its headquarters in Copenhagen in June. The program will provide startups with exclusive access to Maersk leaders across departments as well as the company’s network of suppliers and partners to help validate their technologies. Startups will also gain insight into the technology systems already in use at Maersk and association with the brand will inevitably open doors in the future. “We want to be the rocket fuel for these startups so together we can create significant impact across our value-chain,” says Jorgensen. Participating startups will be in the running for an equity investment from Maersk Growth. As a major transporter of food globally, Maersk is no stranger to the challenge of food loss; one-third of food grown for human consumption is wasted and of that 80% occurs before it reaches retail stores. 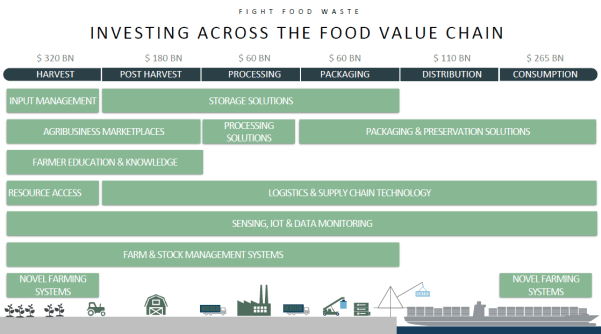 Startups with technologies aiming to combat food waste are eligible to take part in the month-long support program that’s aimed at validating how their business can be accelerated by the global presence, infrastructure and industry expertise Maersk has to offer, potentially ending in an investment from Maersk’s venture arm — Maersk Growth. “With food waste being a trillion-dollar issue, it is simply good business for everyone in the value chain to address it, and we want to play our part in that,” says Jorgensen. Combatting food waste with technology could also play a key role in addressing supply chain efficiency and transparency, which Maersk is also committed to as part of its alignment with the UN’s Sustainability Development Goals. Maersk believes investing in startups is a key way to meet these goals as they bring a new perspective and can offer diversity from other industries. “Startups make us think differently about the challenges we want to solve,” says Jorgensen. To that end, Maersk set up its venture arm in 2017 and decided to work with Rockstart on a program to get exposure to a wider number of entrepreneurs. While an equity investment is a potential outcome of the program, Maersk is already investing in the startups in the program by paying for their travel and accommodation expenses and does not require startups to give up any equity. But there is still a clear value proposition for the logistics giant. Maersk wants a broad range of startups to apply to the program with a focus on combating food loss from field to distribution. Technologies interesting to Maersk include packaging and preservation methods, improved information systems encouraging more transparency and information sharing across the supply chain, food condition tracking and analysis to determine if something is spoiling across the whole value chain, and new market opportunities where farmers and stakeholders can redistribute surplus produce. To apply before the May 20 deadline, please click here.